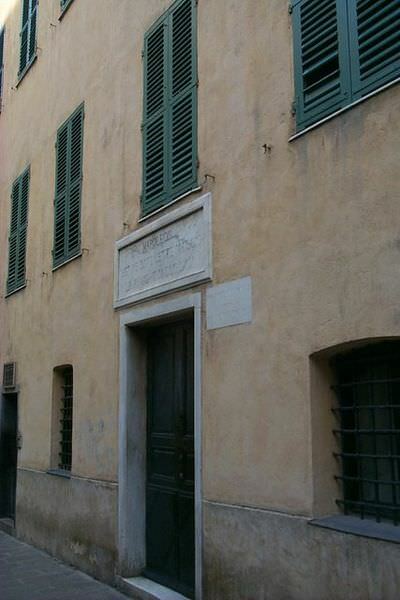 The house in Ajaccio, Corsica in which Napoleon Bonaparte was born. Napoleon Bonaparte was born on Tuesday, August 15, 1769, in Ajaccio, Corsica. France had acquired Corsica from the Italian city-state of Genoa the year before. Napoleon’s parents were Carlo and Letizia (Ramolino) Buonaparte. Their first surviving child, Giuseppe (Joseph), was 19 months old when Napoleon was born. Two older children, born in 1765 and 1767, had died in infancy. August 15 marks the celebration of the Catholic Feast of the Assumption of Our Lady the Virgin Mary. Letizia was at mass in the Ajaccio cathedral when she felt severe labour pains. She left the service and walked the short distance to her house (Casa Buonaparte, now a museum), aided by Carlo’s sister Gertrude Paravicini. Nine days later, Letizia turned 19 years old. Nobody recorded anything about Napoleon’s birth at the time, and Letizia did not leave detailed memoirs. It wasn’t until Napoleon became a famous general that people became interested in his origins. Many myths sprang up surrounding his birth. The account above is generally the received one, originally printed in a 19th century biography of Letizia by Félix Hippolyte Larrey (son of Napoleonic military surgeon Dominique Jean Larrey). However even this can be disputed. Napoleon’s brother Joseph told Charles Ingersoll, one of his friends in the United States, that Napoleon was not born in the salon. Another myth claims that Napoleon was born or laid on a carpet or tapestry on which were woven scenes from The Iliad and The Odyssey, or – in another version – the conquests of Alexander the Great and Julius Caesar. Napoleon himself repeated the story of being born on a carpet when he was in exile on St. Helena. Even Napoleon’s birth date was contested. Some people argued that Napoleon had been born in 1768, and that Joseph was the younger of the two. The record of Napoleon’s baptism on July 21, 1771, confirms his August 15, 1769 birth. 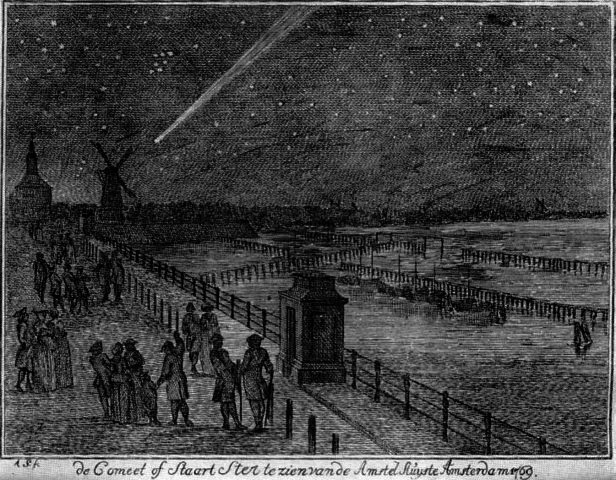 The Great Comet of 1769 over Amsterdam. The one element of Napoleon’s birth that might appear to be mythical but actually is not is the appearance of a comet in the sky over Europe. This was comet C/1769 P1, first observed by astronomer Charles Messier at the Naval Observatory in Paris on the evening of August 8, 1769. According to observers, the comet became brighter through the month of August, with a lengthening tail. It made its closest approach to earth on September 10. Messier himself later sought to associate his comet with Napoleon’s birth, hoping to receive the Emperor’s attention and monetary support. This was, perhaps, Napoleon’s original “lucky star,” for which he searches the sky in Napoleon in America. As the comet has an estimated orbital period of around 2090 years, it has not been seen since 1769. H. Noel Williams, The Women Bonapartes, Vol. 1 (New York, 1909), 24. Charles J. Ingersoll, History of the Second War between the United States of America and Great Britain, Second Series, Vol. 1 (Philadelphia, 1853), pp. 169-170. Francesco Antommarchi, The Last Days of the Emperor Napoleon, Vol. I (London, 1825), p. 257. Other St. Helena memoirs have Napoleon saying a version of this, e.g. : “On August 15, 1769, [my mother] was on her way home from church, when she felt the pains of labor, and had only time to get into the house, when I was born, not a bed, but on a heap of tapestry.” Gaspard Gourgaud, Talks of Napoleon at St. Helena, translated by Elizabeth Wormeley Latimer, 2nd edition (Chicago, 1904), p. 37. Félix Hippolyte Larrey, Madame mère (Napoleonis mater): essai historique, Vol. 1 (Paris, 1892), p. 54. Napoleon is sooooo fortunate that France had acquired Corsica from the Italian city-state of Genoa the year before his birth. Otherwise his career would have been nipped in the bud, before it even started. How random life events are! Excellent point, Hels. A good reminder of the many “what if’s” due to accidents of birth. Napoleon had a glorious turbulent life, relatively short. People in Sardinia, next to Corsica, live the longest, on a diet based on beans and vegetables, meat twice a month, with active life styles. Their chance to live a 100 years is 1 in 1,000, compared with 1 in 5,000 in USA. Thanks, John. I didn’t know there was such a disparity between Sardinian and American lifespans. It’s too bad the Bonapartes tended to have their lives shortened by cancer. Interesting — I never knew about the comet. It reminded me of Tecumseh’s birth a year before. He was named after a shooting star that appeared when he was born. Thanks, Ann Marie. I didn’t know that about Tecumseh. It’s interesting how these celestial events were taken as portents. I wonder what they were taken to mean for all the other people who were born around the same time and never became famous. Fascinating facts and a very interesting article. Thanks for sharing. I very much enjoy accurate historical fiction. Can you recommend a novel based on Napoleon’s early life in Ajaccio. We will be visiting there soon. You might want to read The Boy Life of Napoleon by Eugénie Foa. The English version (published in 1895) is available for free on the Internet Archive: https://archive.org/details/boylifeofnapoleo00d185. You could also take a look at my post on Napoleon in historical fiction to see if anything there sounds appealing. The Eagle and the Rock by Frances Winwar and the first book in Max Gallo’s Napoleon Quartet touch on Napoleon’s early life. Have a good trip! We visited Bonifacio last year & saw a building which was named as being the birthplace of Napoleon but I always believed him to have been born up the coast in Ajaccio. Can you explain? You’re right, Lizzie. Napoleon was born in the Casa Buonaparte in Ajaccio. Napoleon lived briefly in Bonifacio in 1793, in a house on the Rue des Deux Empereurs. There is apparently a commemorative plaque on the building, so that may be what you saw. What is interesting is that Napoleon was so far ahead of his siblings….. brighter, quicker, brilliant strategist, more decisive and ambitious…. Why? It is interesting. I guess that was just his luck in the genetic draw. 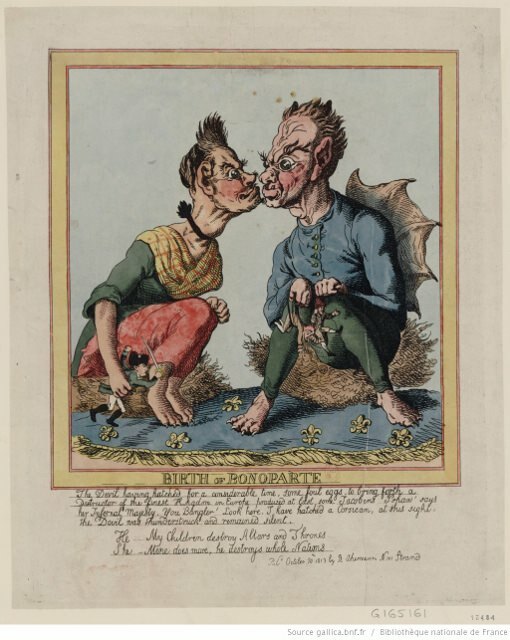 She was delivered of her fourth child – a boy, with a big head and a very intelligent face, who screamed loudly, and soon began sucking his thumb, which was considered a good augury among the peasants of Corsica.